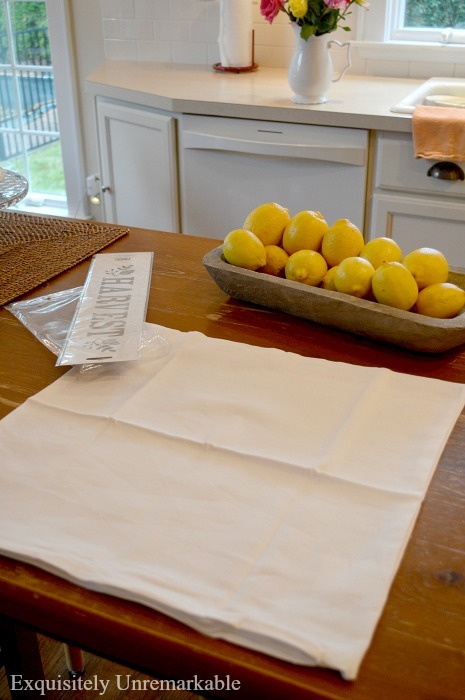 Learn how to stencil a pillow. 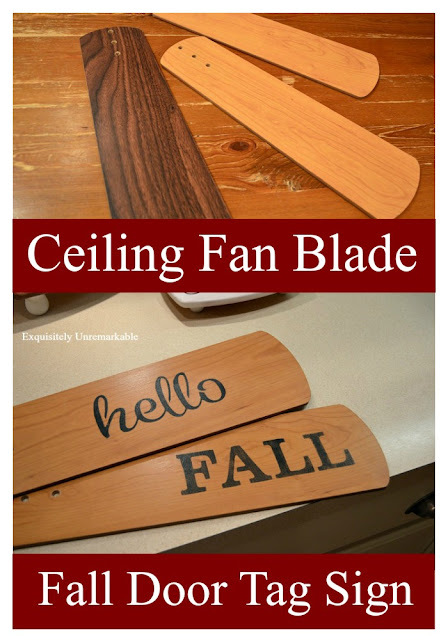 It's an easy DIY and looks great even if it's not perfect. Trust me. Hello friends! 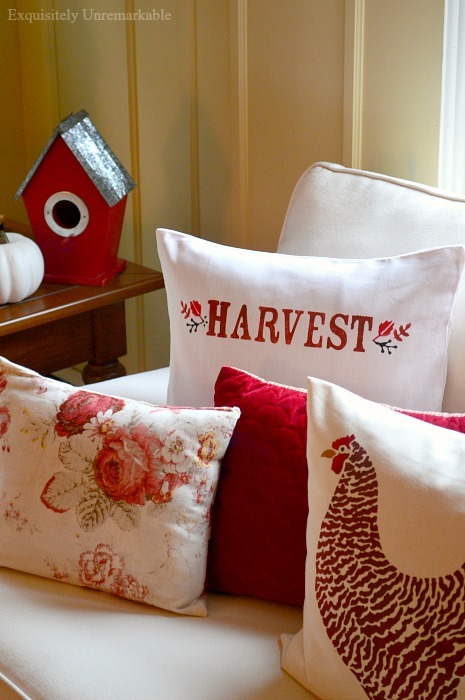 Today, I'm decorating for autumn, adding a little bit of cottage charm to my living room with another pillow. Go figure. I saw this stencil at the craft store a few weeks ago and I thought it would make a very sweet addition to the room. I was right. I love it. It's that time of year when the leaves start to drop and I feel the need to bring the color back into the house. 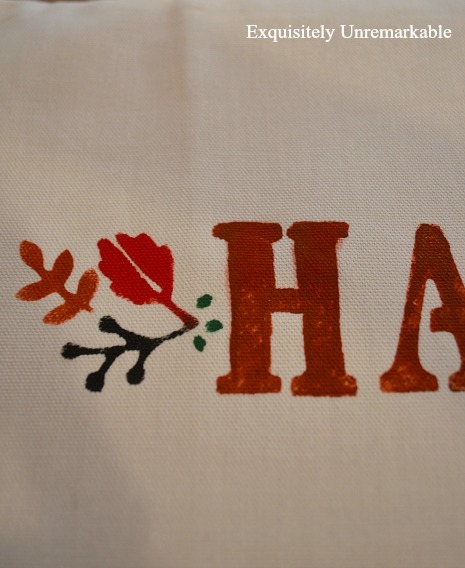 So I grabbed my fabric paint, in harvest hues, of course and transformed a plain old pillow cover into a fun fall accessory. I could've made my own pillow cover, but this one ~ with a zipper mind you ~ was so cheap at the craft store that it didn't make sense. Besides, I don't love sewing, even if my machine has been behaving better lately. I started by taking it out of the package and ironing it. I had to use steam to make the wrinkles completely disappear. I needed a totally flat surface to work on. Stenciling over bumps, whether they're on walls or fabric, is a disaster. I placed a piece of cardboard inside the cover so the paint wouldn't bleed through to the back. It also provided a very sturdy surface to paint on. Anyway. I also didn't use a ruler. Rulers can be deceiving. The fabric lines aren't always perfect, so what measures straight, might not look straight and that would drive me crazy every time I peeked at my pillow. I perfected my stencil placement by eye instead. I gathered my supplies ~ fabric paint, cups for paint, stencil brushes, foam and bristled, and also a few regular brushes for details ~ and got to work. As always, I stirred my paint, plopped some in a cup, dipped my brush into it, tamped the excess off on a paper towel and then applied it to the stencil in even, straight up and down, stomping motions. I used the bigger round brushes for the letters and smaller one on the leaves. Now, remember when I said I would rather have less than perfect letters than less than perfect lungs (which I already have btw), well, that's what I got. It happens. I can't say if it would happen less with the adhesive, since I've never used it, but sometimes when I stencil, I get blobs. Truth? I could've hidden it, because it can be fixed. Well, mitigated is probably a better word, but either way, with a little paint, a few tricks of the camera and my zipped lips, you'd have been none the wiser. Look at me. A total pro. Always. But that's not the truth and that's not me. I'm not a pro, far from it, and I'm here, sharing craft tutorials on my site, because I want people to take a risk, to try something new, to be empowered that they can make beautiful things...and if they're not perfectly perfect that's ok.
Heck, my professional bio states "she doesn't own any powers tools and can't sew in a straight line, so just don't look too close." It's the truth. 100%. And you know what...nobody ever looks that close. They just see the pretty. So, throwing it back to my pre-blogging career, I'm going to call this a teachable moment and share my mess. And how to fix it in case it happens to you. Are you ready for the secret? Yeah, there is no secret, just take a brush and straighten out the letters. The end. Not tricky at all. That "H" turned out a little darker and thicker than the others, so I added a few green dots to the design as a bit of a visual distraction, but overall, it's no big deal. Like I said, not perfect, but now it has what I call hand painted charm. Once it's on the couch no one will notice...or frankly care. Crafting crisis averted. So. Now that the mess has been taken care of, you may be wondering about the placement of my stencil. It's so high, it's not centered at all. It looks odd just hanging out up there. What was she thinking? Actually, I was thinking that I knew exactly where I would be placing this pillow before I started painting and I needed the words to be all the way up top, so the pillows in front of it wouldn't cover them up. This way, they are prominently featured. Peeking out over my placemat pillow. Even the head of my stenciled rooster (ok, chicken) pillow. And I think it looks totally perfect. 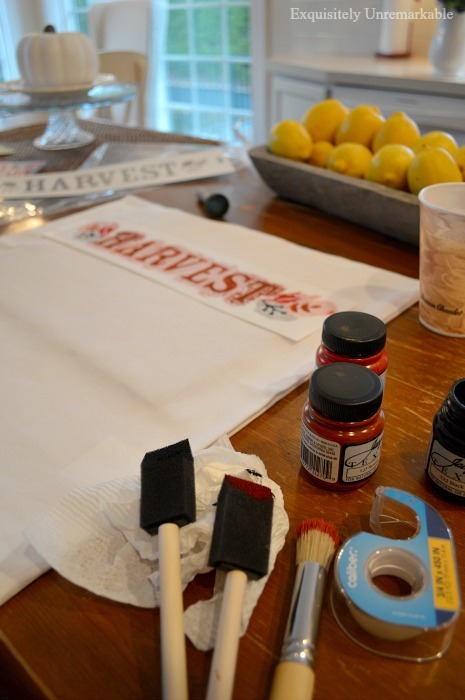 Are you a perfectionist crafter? It looks perfect in your home and with your pillows! I just love the colors in your home. I consider your house "a gathered home" created over time and with love. No one is perfect! Thanks, Brenda! I am a color girl for sure...and a gatherer. And you're right, no one is perfect, so we shouldn't expect our homes to be either. The pillow turned out perfectly imperfect as they say! It looks wonderful. Thank you so much! Just don't look too close. Ha! I love your imperfect pillow. That is so cool you can buy those pillow cases already sewn. 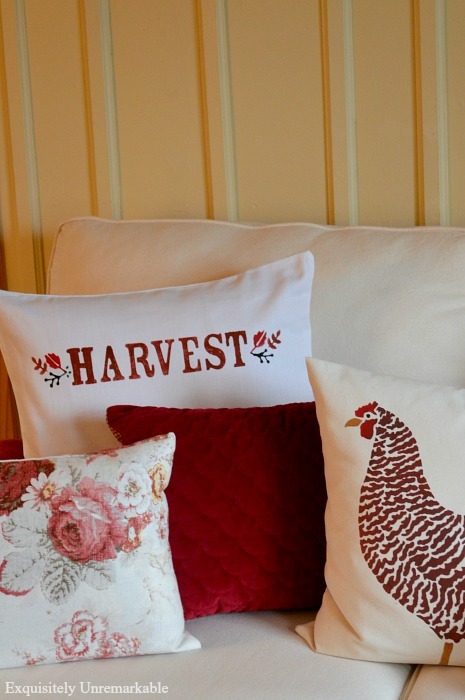 Love the stencil and love this new creation with all your other pillows. Looks cozy and fall. And it has a zipper, Kris! Cost me less and $5 with the coupon. I couldn't make it for that...And thanks so much my friend. I think that your pillow and your pillow arrangement looks great. 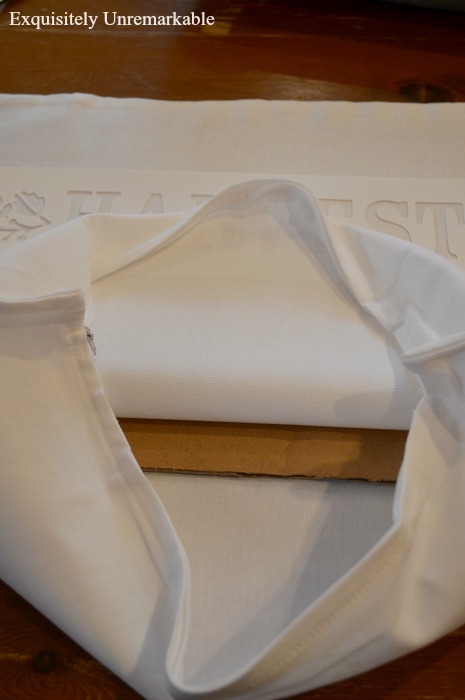 That you planned ahead to put the stencil at the top of the pillow knowing where it would be placed makes it so much easier than making or finding a pillow and then trying to fit it in to a grouping. I like how you have used color to tie together several elements. Nice job on the 'fix'. Thanks, Lorri! I planned to use an existing pillow for the cover. I knew it’d be tucked in the back based on the other pillows on the couch. If I was making it new, I probably would’ve chosen more of lumbar style to showcase the long word. But this works, too! I think it looks perfect! That's one of the benefits of relaxed decorating. The imperfections are what gives it character. Relaxed decorating...genius description, Debbie, thank you! 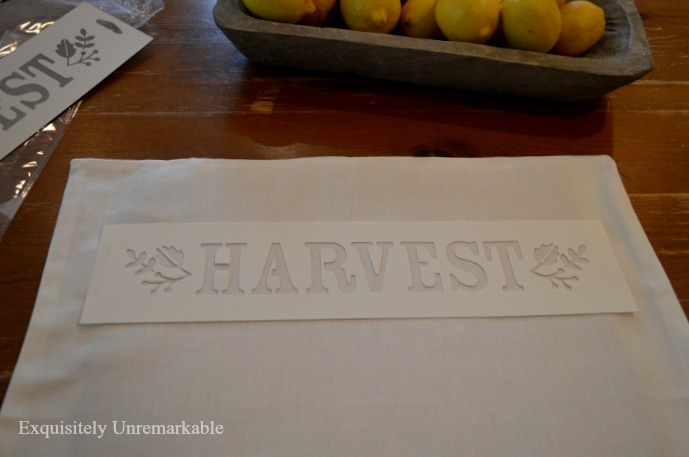 I love the Harvest pillow, looks so cute. Thanks Betty! The stencil and the pillow cover cost me less than $5.00. I love a bargain! 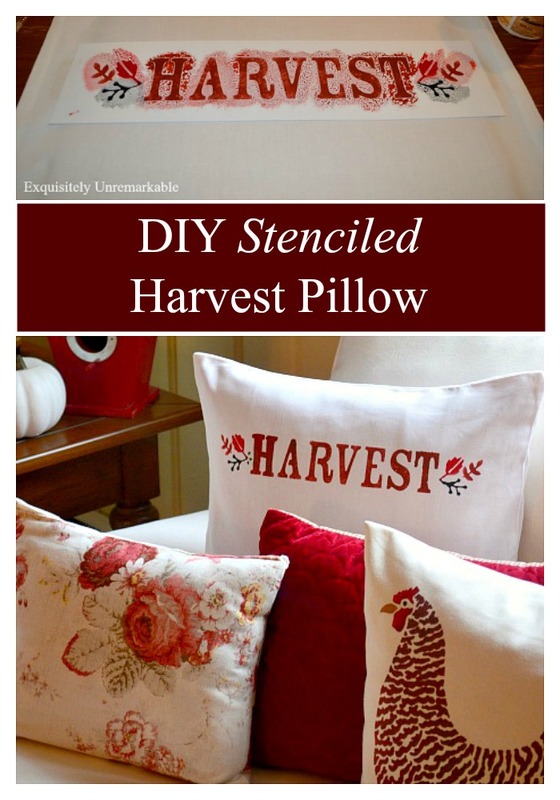 You're so smart to think of the placement of the pillow BEFORE you stenciled it. See, I would think of that AFTER and it would have been so sad. Lol! You really did a good job on this! So cute!! 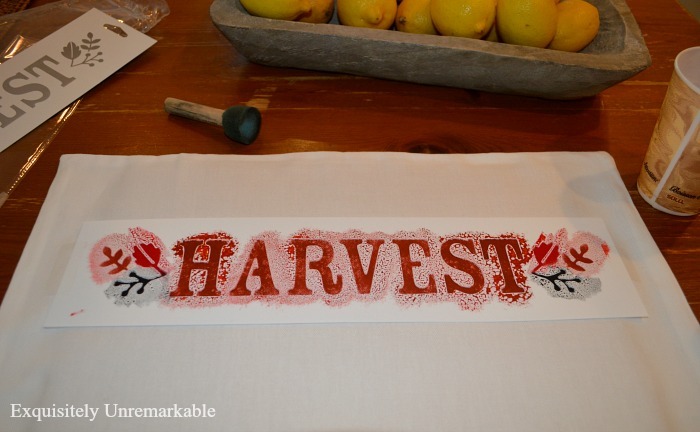 I love the colors and the word HARVEST. Great job! Thanks Stacey! I wanted to decorate for Thanksgiving and fall before the Christmas push. You know I was looking and looking for that imperfection and just couldn't find it. All I saw was loads of character and charm! You are too sweet, Mary, thanks! I love the pillow! So nice to see pretty Thanksgiving decor! Thanks so much, RJ! I am embracing turkeys right now. I love your harvest pillow you made Kim! 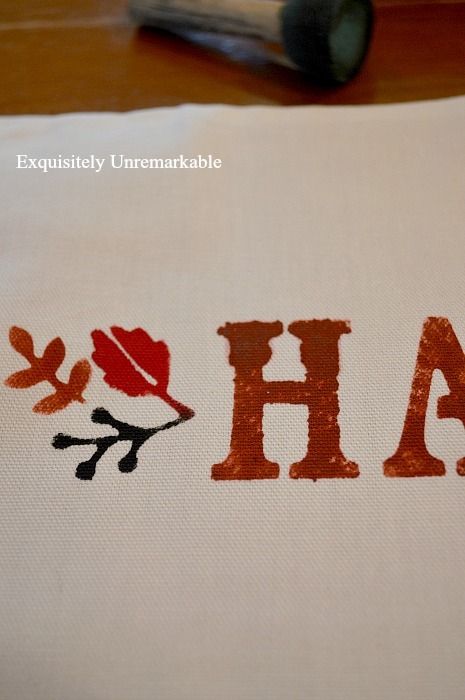 I have never stenciled before and I will have to try it sometime. You make it looks so easy. I will have to visit the craft store soon and make a Christmas pillow. Thanks for the inspiration! If I was a perfectionist I'd never sew :) You did a wonderful job and this was a great tutorial. Thanks Deb. Exactly...and I never see anything but perfection when I look at your quilts. Of course I'm not a perfectionist blogger and that's why I enjoyed this post so much. I laughed and I marveled at how you had the forethought to place the stencil high. That in itself is perfect crafting thinking. ;) You are now one of my favorite co/crafters. My name is Clearissa and I am an imperfect blogger too. I love your blog. Clearissa, what a super kind comment. I am glad to hear that I am not alone in my half hearted pursuit of perfection. Lovely meeting you, thanks so much for the visit and looking forward to chatting again! Oh my, no! I am not a perfectionist crafter. Does it function? That's my criteria. Although, I must admit, imperfevtions give me opportunity to fight the slight OCD, and kick it to the curb. Good practice, right? I've told you before you're a genius! Its perfect, and truthfully its the way regular people craft. It turned out great and looks perfect with the other pillows! Deanna, you just made my day! And you are so right, my friend, this is how I have always crafted, long before I even knew what a blog was. This is also how I want people to approach crafting, with a "can do" and "it's ok" attitude rather than chasing perfection. That's too much pressure and crafting should be fun! Happy weekend! Ha! I would never have thought to stencil it higher so it peaked out above the other pillows. Smart girl! It is very cute, and no, I would not have noticed if you didn't reveal. I have so many mistakes on things I have made all over my house, but for a gift, I'd have a harder time with it. It is perfect just the way it is, bright, bold, festive, handmade, charming! It looks beautiful in its intended space! Thank you, Poppy! I really do like it, imperfections and all! Love your pillow Kim and it looks great with the others! It looks perfect to me and beautiful in your space. What a beautiful autumn pillow! Kisses!!! I think it looks great...how often we are our own worst critics! I totally agree, Carol! And thank you friend. Thanks Carla! I guess is imperfect can be perfect! 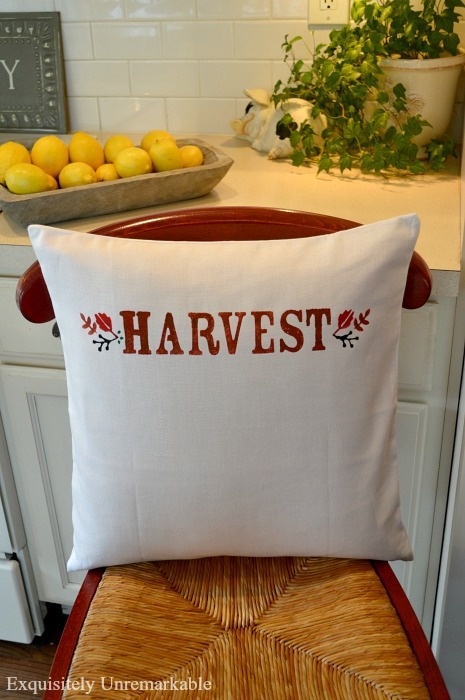 What a lovely harvest pillow. 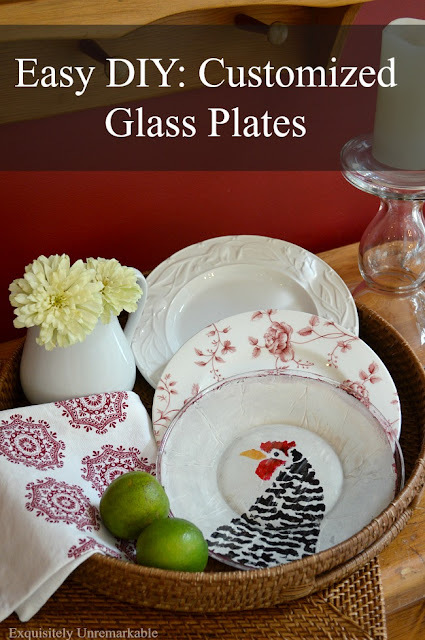 It's a great and inexpensive gift to make and give as a hostess gift. Great idea, Vanessa! And thanks! Thank you, Teri! I am trying to embrace fall before Christmas comes and sweeps it all away! The blobs on the "H" looked so even, they looked like they were supposed to be there. Ha! But I totally love the fix. I probably would have panicked & gnashed my teeth. How wise to put the letters up high. I need you to come over & tell me what kind of pillow I need in a chair I have. Nice "gotcha" with the height of the HARVEST, Kim. I should have known better than to question its placement. Nice plan. Hugs.